The Railway Man is the story of an ordinary man whose horrific experiences as a POW left him emotionally crippled for decades after the war until he confronted and ultimately forgave the target of his old, deep hatred. Thousands of ex-POWs, including my father, shared the first part of that sentence; very few were willing or able to achieve the second part. 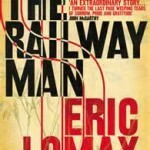 Eric Lomax’s journey reveals the dark world of intentionally buried horrors and shows us that there is – to use his favorite railroad metaphor – a light at the end of the tunnel. Eric Lomax’s book was published in 1995, a product of the long process of coming to grips with his demons. He acknowledged that he was able to do so only with the help and encouragement of his second wife Patti and an organization called the Medical Foundation for the Care of Victims of Torture (known today as Freedom from Torture), a British charity that provides psychological and therapeutic care for survivors of torture. For forty years he bottled up his terrible memories as an undiagnosed, untreated case of PTSD. They emerged sporadically in erratic emotional responses to social situations and in raving nightmares. His book, a coherent, articulate, and honest autobiography, is a testament not only to his will to survive (which is clearly evident in the war chapters), but his will to heal. When Japanese guards discovered both the radio and map in mid-1943, they subjected the officers to terrible beatings during which two of the men died and Lomax was left lying in a heap of blood and broken bones. As the mapmaker, he was singled out for further interrogation and brutal torture which included what we call waterboarding today. His memories of this terrible time came to focus on the slight Japanese interpreter who translated during the endless interrogations and was present during the torture. Eventually, the prisoners were tried and sentenced to long prison terms. Lomax describes the squalid conditions, near starvation, and his broken and deteriorating physical condition with astonishing detail, including his two successful attempts to sicken and injure himself to the point of near death, which allowed him a brief reprieve at a POW hospital. He survived the war, a distorted shadow of his former self, and closed and locked the door on those dark days. “The Railway Man” was made into a movie, released in 2013, starring Colin Firth as Lomax and Nicole Kidman as Patti. I watched the movie and read the book, in that order. As is generally the case, the book is better: it offers a great deal more background and context, as well as an accurate account of events and the depth of Lomax’s personal struggles. Still, the film gripped me in a powerful and personal way as I watched the scenes of malicious abuse of POWs at the hands of their Japanese captors and moments of heroism in the midst of horror. I wept for my father and the Wake POWs who endured similar experiences. After the war, the face of Lomax looked at me with the same stoic mask as my father wore until the day he died. Although the film version edited, altered, and blatantly fictionalized many aspects of the book, it still packed a punch, in large part due to the excellent actors portraying Lomax in the 1980s (Firth) and in war flashbacks (Jeremy Irvine, who bears an uncanny resemblance to photographs of young Lomax). It is not mentioned in the movie, but Lomax married and had a family and career in the decades after the war, though the marriage fell apart. Only after his second marriage to Patti did Lomax begin to force open that long-locked door. When a fellow ex-POW shared a 1989 newspaper article about a Japanese man who had worked as an interpreter during the war and regretted the atrocities committed by the Japanese army, Lomax recognized his tormentor: Takashi Nagase. His first desire for revenge was gradually and firmly replaced by the need to meet and forgive this man who had unfairly borne the war crimes of a nation. Together they were able to cast out their demons and build a bridge of friendship that lasted to their deaths. Read this important book, see the movie, and watch this excerpt of Mike Finlason’s 1995 documentary “Enemy, My Friend?” which shows the poignant 1933 reunion of Eric Lomax and Takashi Nagase.